JSAV Mexico starts operations in Puerto Vallarta, Nuevo Vallarta and Riviera Nayarit. 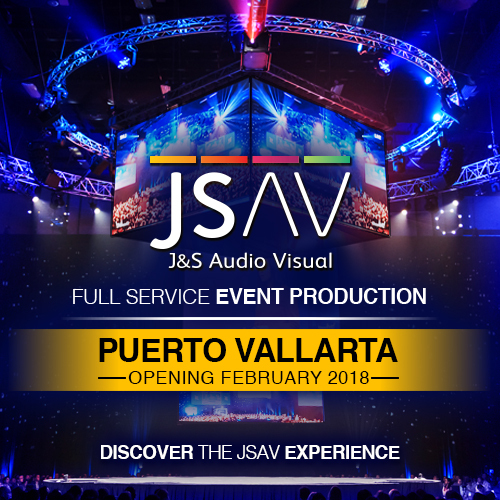 With an important investment in high-end technology, JSAV gets to the Mexican pacific to keep on working with groups and conventions. Since 2017 Puerto Vallarta’s area become the second most important destination in Mexico, just after the favorite Cancun. With the offer of 23,000 rooms and the opening of new convention centers, the area has become one of the most popular places for meetings, conventions, and incentive groups. JSAV now offers the same services and guarantee the production quality receive in the main location, Riviera Maya. The investment includes a new warehouse with more than 1800 square meters, not only for audiovisual services but with a full workshop for scenic development. Operations officially began in February 2018 with a great success and the support of hotels and meeting planners. Puerto Vallarta is not just a natural paradise, but one of the most secure places in México. The culture richness is also valued for visitors from all over the world. The future seems very positive, with the public and the private support, Puerto Vallarta will continue growing for business tourism.